The Drawmer 1978 builds on the success of the award winning 1973 multiband FET compressor and adorns an unparalleled array of controls to give complete mastering over your mix, and all in a deceptively simple 1U frame. 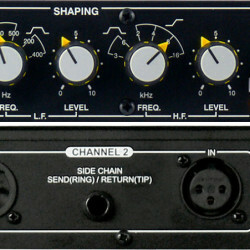 The 1978 is a Buss Compressor like no other – compression with character, controlled distortion, tonal shaping, wet/dry mixing – others have tried but have never managed to build a compressor that is this versatile and yet intuative. It’s never been easier to get that elusive characteristic sound that sets you apart from the rest. Glue your mix, bring out the bass, control the highs, add warmth, distortion, smoothen, widen, sound less digital more analogue – and at a price that’s right for even the smallest studio. Variable Wet/Dry Mix plus Output Gain Knobs give a ‘Parallel Compression’ function without the need for external mixing devices, providing Complete and Effortless Control over the amount of compression used and Output Levels. 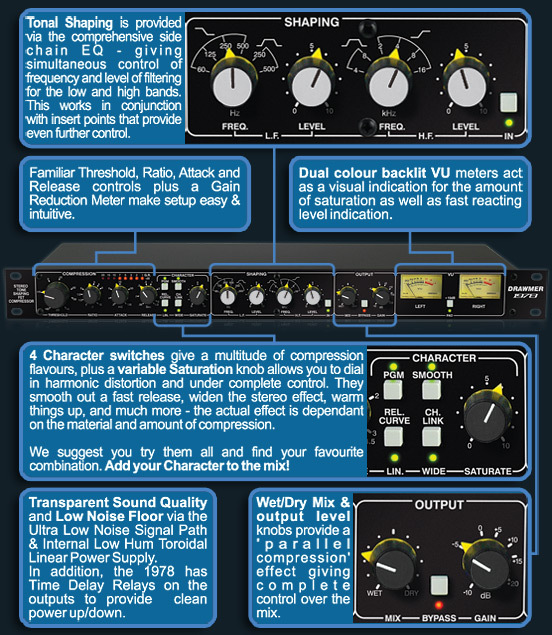 Mix Control – Pricisely Control the Amount of Compression Applied! Incorporated into the 1978 is the ‘Mix’ Control. This acts like a ‘parallel compression’ effect that mixes the Wet (compressed) and Dry (original) signals to provide a simple and exact way of controlling the amount of compression used – all with the turn of a single knob. With the extensive controls of the 1978, such as saturation and tonal shaping, it could be possible to take the effects too far and ruin a mix – this is easily prevented by the use of the Mix control just by mixing in less of the wet signal and more dry. By the same token, the mix control can add more of the wet signal. It’s that simple!